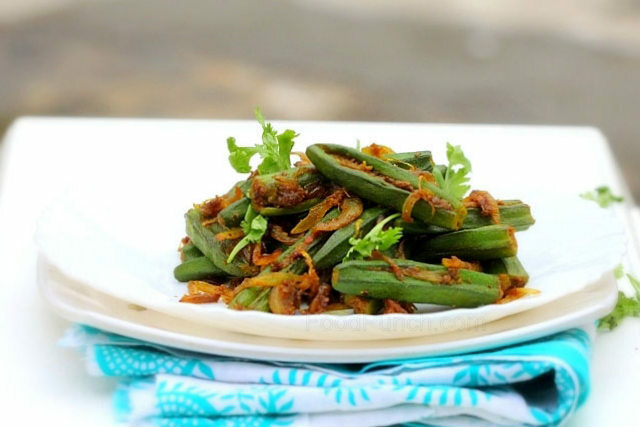 A north Indian stuffed okra recipe with the twist of extra garlic and green chillies, sinfully spicier. It’s another quintessential recipe from an Indian kitchen that’s been cooked as a side for most special occasions across our country. As diversity of this land would have it, every region has its own little twist, and that I feel makes each one of them share worthy. 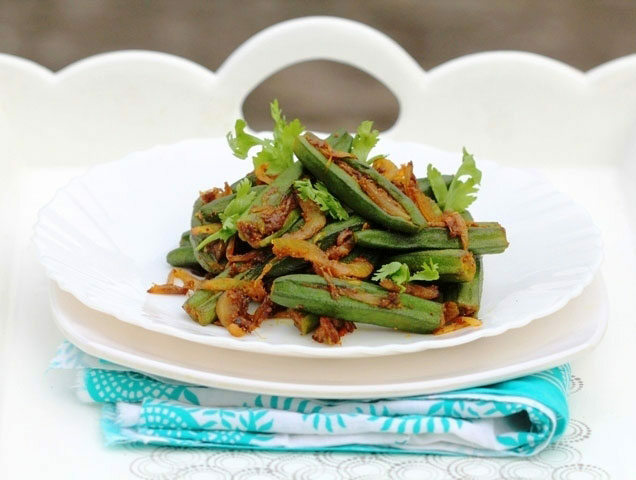 It is not an attempt to justify my recipe for I need none when it comes to Bhindi or Okra, it’s a staple at my home and I cook it atleast twice every week, do not miss to read ‘atleast’. We cook it so often more because it’s one of the only two or three green vegetables my Mr. H likes (oh, when it comes to food he is no less spoilt than a kid, all thanks to mom’s great spicy cooking). 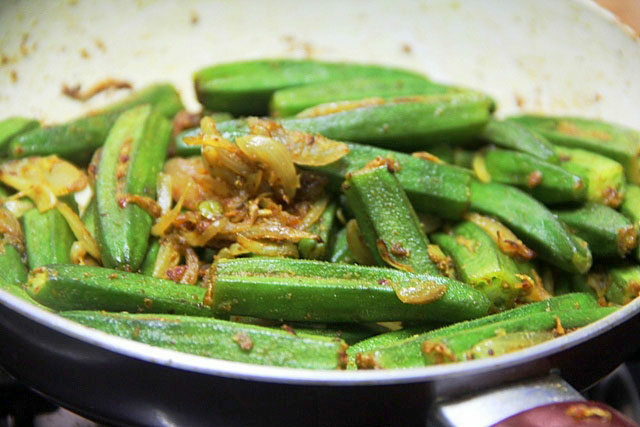 Not that I am saying I don’t like okra infact I love it too and that’s only why it is allowed to be cooked that often, after all I am the master of our kitchen. The point of telling is that when we cook something so often, we develop our own favourite variation to the otherwise traditional recipe and that is the story of this preparation here. 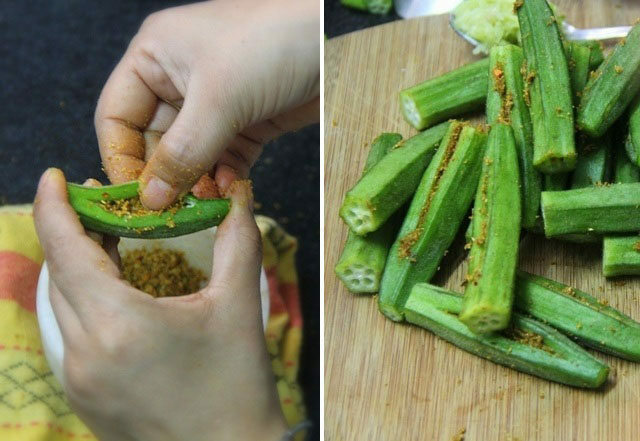 Of all the variety of stir fries and even some curries that we make out of this ‘lady fingers’(I often wonder why that name), the stuffed okra recipe has a celebratory ring to it and though cooking it is a little elaborate and needs patience, specially to stuff the okra, the effort is all worth. I’d say get an extra set of hands if you are making for many people, better still your okra loving hubby or child, or stuffing while catching your favourite show on television won’t be a bad idea either. Oh and a word of caution, I tried stuffing the okras with a small tea spoon first but it seemed to take way longer, so I finally digged my hands and it was much quicker. Wash and nicely dry the okras. Trim the ends and make a long slit sparing ½ inch from each end and keep aside. Crush the garlic and chillies together in the mortar and pestle (you may alternatively use 2 tsp garlic and chilli paste straightaway). Remove 1/3rd of this paste and keep aside. 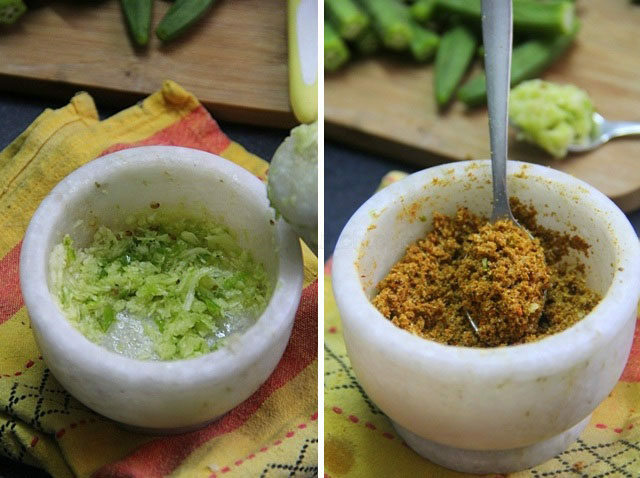 Now dry roast, 1 tbsp coriander pwd, 1 tsp cumin pwd, ½ tsp chilli pwd, 1 tsp amchoor (dry mango) pwd and garam masala until fragrant , just 2-3 mins. 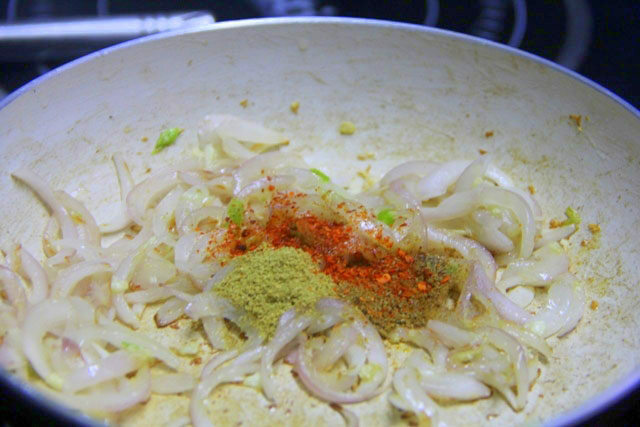 Add this mixture to the remaining garlic mixture in the mortar, dress with salt to taste and 4-5 drops of mustard oil and mix well, using the pestle to incorporate. Now stuff this mixture into the okra (using a tsp or your hand as you prefer), slightly press the okra from two ends between the thumb and pointer to spread the slit a little and the stuff it with the spices. 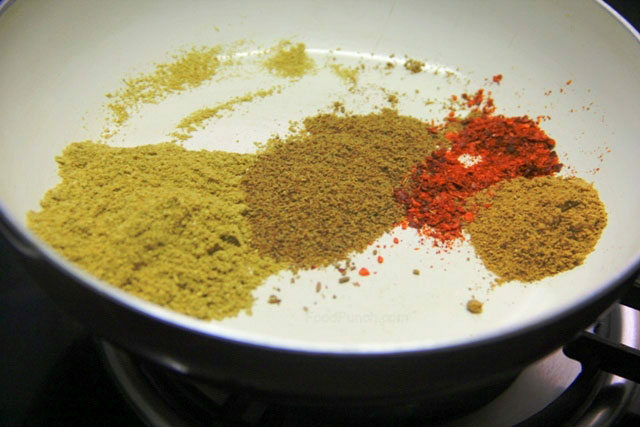 Keed the leftover spices mix aside. Now in the frying pan heat 1 tbsp oil, add the sliced onion and fry till just translucent and add all the remaining spices and the crushed garlic-chili that you’d kept aside, fry for just a min and add the okras. Stir fry on medium heat until almost cooked, about 8-10 mins only dress with a little more salt, turn the heat to high and cook for another 2-3 mins and remove from the heat. 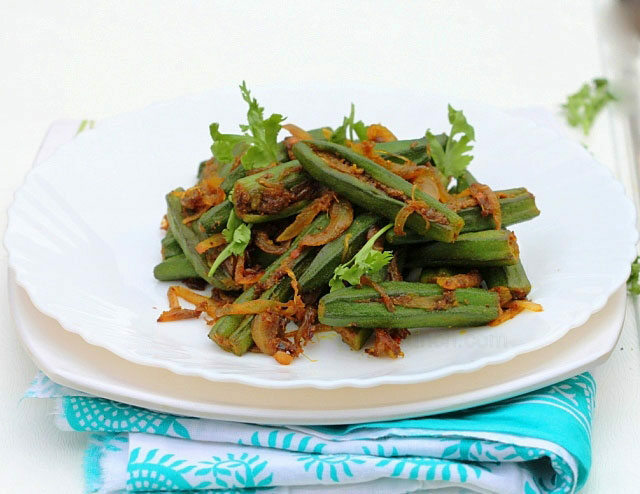 Dress with some green coriander leaves and serve as a side with Lentils and Chapati, or with pooris. 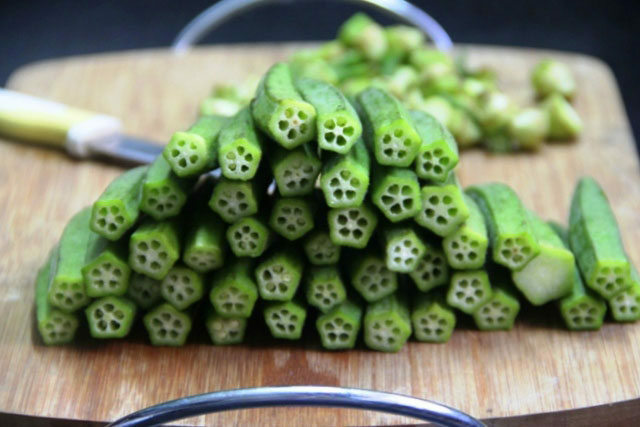 Do not cut the okras unless they water has completely dried, preferably dry between kitchen towels. Do cook longer if so you prefer, but retaining a little crunch with green color is how we prefer. This okra looks so nice Anu, really like the okra picture.